Every Saturday, a group of people gathers in silent protest in Galatasaray Square in the heart of Istanbul. 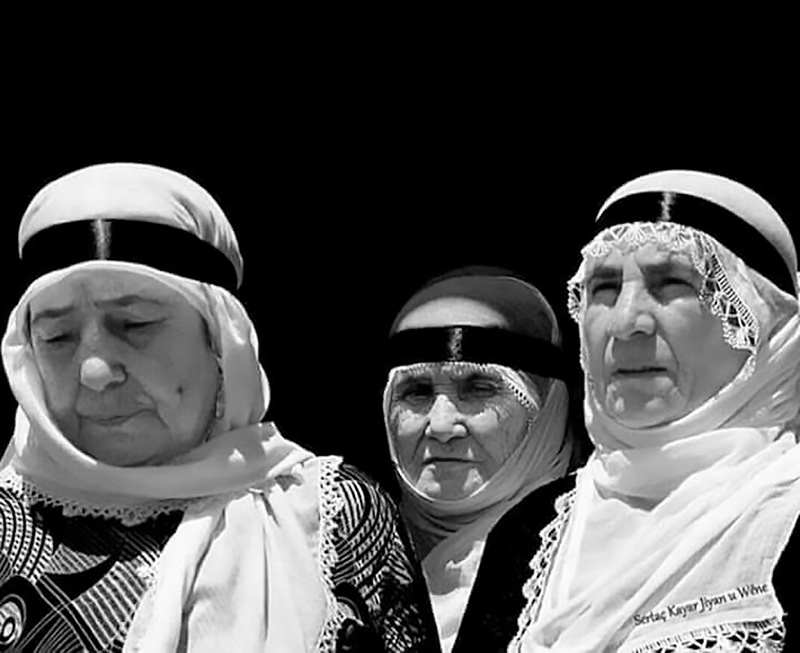 This group, known as the Saturday Mothers (Cumartesi Anneleri in Turkish), is primarily composed of older Kurdish women. 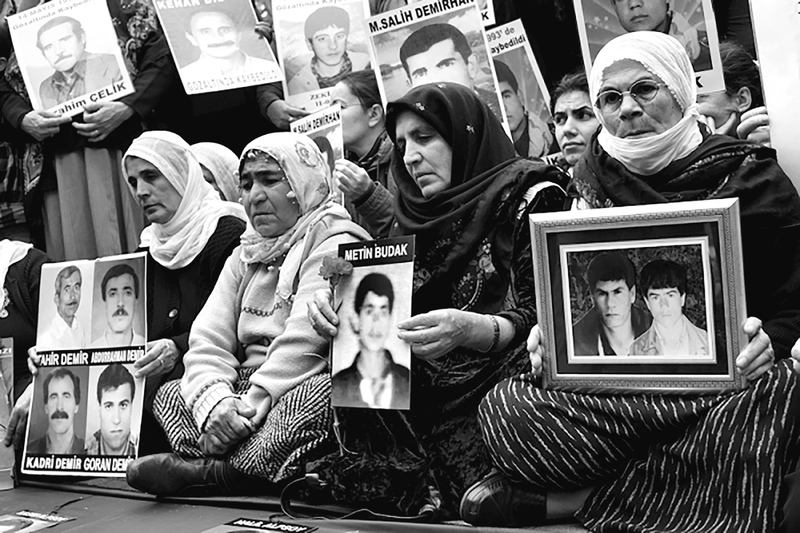 The protests, which resemble those by the Madres del Plaza del Mayo in Argentina, consist of the mothers (and other relatives of the disappeared) silently displaying photographs of loved ones disappeared by the Turkish state, military, and paramilitary forces. 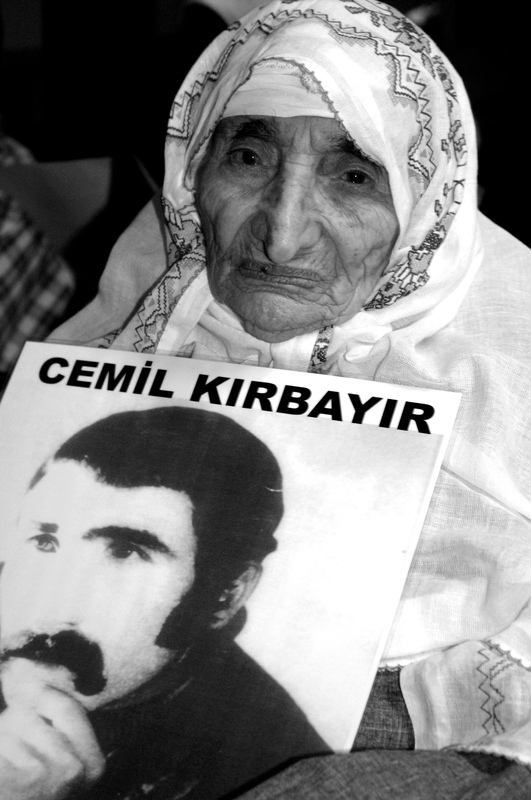 The protests began in 1995, when the remains of the young Kurdish socialist leader Hasan Ocak were discovered, and have grown since then, especially once more Kurdish women realized they were not alone in their experiences. Apart from a long hiatus caused by police violence against the mothers, the protestors have gathered every Saturday for over twenty years. The Saturday Mothers movement is powerful because it represents a group of people who often remain outside prevailing ideas of politics, posing a challenge to liberal accounts of political life. They mobilize the affective power of grief and pain in the service of radically new forms of social and political activism. Actualized by the disappearance of the child—the unfillable void of their absence, of their body gone missing—Kurdish motherhood transforms into a potent site for imagining a radical politics through affect. Affects like grief are sticky: grief moves through bodies and brings them together, as we can see in the formation of the Saturday Mothers. What is the social life of grief? How does it circulate through these gatherings of Kurdish mothers, making them cohere in unstable alliance? I will examine the personal testimonies of these women, attending to the ways in which they narrate their grief and their consequent entrance into the space of politics. Rather than adhereing to conventions of motherhood, these women take the destructive and hierarchical logics of patriarchy and ethno-nationalism and invert them upon themselves. It is through their political engagement, actualized by state violence, that these Kurdish women illustrate the fluidity and instability in the construction of motherhood. Building on one of Sara Ahmed’s guiding questions in her chapter on pain in The Cultural Politics of Emotion—”How does pain enter into politics?”—I would like to explore how pain and grief become transformative forces in pushing against and beyond conventional understandings of politics. Rephrasing the question, then, how does pain transform the very definition of the political? Can pain (and grief) undo politics as such? How do these mothers come to politics? One of the first things that many of the women in the Saturday Mothers described, immediately following the disappearance of their husbands and sons, was a sense of being alone, of having nobody to provide support or remedy. State forces invaded their homes, disrupting the domains of the “everyday” that are upheld and underpinned by women’s domestic labor. Gülbahar, for example, described the moment of her disappearance with reference to the everyday items “made dirty” by the soldiers: “They raided our house. They trampled all over our things, our beds, our rugs. We were poor; our rugs and beds were old, and they ruined them.” Other women talk about preparing meals and waiting in vain for their husbands and sons to return from the fields. The state’s disappearance of Kurdish men is not only a violent act of bodily dispossession; it damages the social fabric of women’s everyday lives. Many of these women had no access to economic or financial resources. They were forced to either migrate to a city and work as an unskilled or domestic laborer, or to become a seasonal worker and work on farms that belonged to Turkish landowners. They worked in incredibly harsh, almost slave-like conditions—Zeliha described having to pierce the soles of her feet with a needle in order to drain the blood out of them every night—for aggressive employers who paid them far less than they ought to have earned. The irony of this situation was not lost on Besime, whose employer’s farm was built on the site of a Kurdish village that had been destroyed in the 1980s: “First they came and killed us and now we come back to our land and we work as slaves for them.” Besime’s experience demonstrates the horrific logic of dispossession that was deployed in the region, and against which these women’s collective struggles are directed. Some of these women were able to tap into support networks. One woman who lost her husband eventually began living with four other women in a shared home that was let to them at an extremely low rent by a generous owner. Other women met at the various local branches of the Human Rights Association. As these networks of women grew, and they shared their stories of disappearance and their struggles to stay alive thereafter, the particularity of their experiences generated solidarity among them, as well as an emotional cohesion that set in motion forms of collective, direct action. In spite of their divergent backgrounds and life histories, the pain and the grievances of these women produced a social cohesion that “aligned” their bodies with one another, giving them a community gathered around “such loss.” This mournful, grieving gathering becomes the condition for the Saturday Mothers and the Peace Mothers to meet every Saturday in protest. While these protests take place in silence, one of the mothers is selected every week to read a press release that details the disappearance of her relative—a public witnessing to disappearance, a testimony aimed quite literally at making the personal political. This act helps to reproduce the group’s identity through the narrative representation of the absent body, the body that cannot act as its own witness. The Saturday Mothers’ occupation of public space is spectacular precisely because it confounds state logics of space and being. It challenges the increasing securitization and neoliberalization of public space by making it “the surface of the community” upon which to stake political claims and to imagine new ways of inhabiting and cohabiting. Pain, then, acts as a vector for mobilizing political claims. These mothers, by bringing their bodies out of place—bodies that have already been transformed by pain, physical and psychical—generate a spectacular performance of grief and sorrow that threatens to unravel the hegemony of patriarchal ethno-nationalism. While the Saturday Mothers and Peace Mothers may have initially attempted to locate their children on their own, over time these efforts transformed into a collective process, the goal of which was not the discovery of the remains of one or several specific children, but of all of them. As one woman says, “None of us ever said ‘my child.’ We always said ‘Our children.’” Taking collective ownership over the struggle to find these children means that theirs is a struggle that will never end, since many remains found in mass graves cannot be positively identified. The Saturday Mothers’ goal of recovering all the bodies, a task that is quite literally impossible, gives their weekly demonstration a perpetual urgency. Their grief, in Sara Ahmed’s words, “is a call for action, and a demand for collective politics, as a politics based not on the possibility that we might be reconciled, but on learning to live with the impossibility of reconciliation.” The Saturday Mothers movement imagines the possibility of an alternative public space inhabited by disparate coalitions that have learned “to live with the impossibility of reconciliation” with the government, that eschew reconciliation through a steadfast commitment to the promise of their mourning and its radically transformative potential. Grief and mourning are, most fundamentally, emotional conditions through which we realize the degree of our bodily and subjective interdependency on those who surround us—a realization, paradoxically, only made possible through loss in the first place. Grief and mourning expose to us how our ways of being in the world are inherited and continuously mediated through our social relations. They remind us that our identities are held suspended in the delicate thrall of those relations. Situated in the assiduous potential of grief, the affective politics of the Saturday Mothers thus extend beyond the seemingly insurmountable barrier of state-sanctioned violence and biopolitical control. Their struggle is an insistent reminder that politics as such is always an insufficient idiom. And it is an assurance that they will be there, unyielding, to renew the life that was erased, to insist upon an affective and revolutionary reckoning.